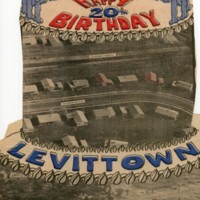 A news clipping from the scrapbook of William and Simone Levitt commemorating the 20th birthday of Levittown, NY. 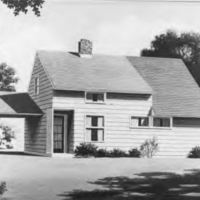 The newspaper in which the original clipping appeared is unidentified. 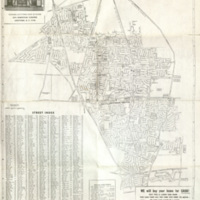 A map of Levittown, NY from a mailer for the real-estate company Levittown Equities Inc.
A work crew working on the lawn of a finished Levittown home. 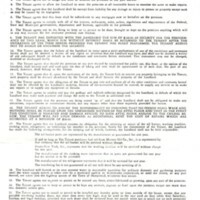 The first page of a lease agreement for a Levittown home with covenants the tenant agreed to abide by during his occupancy of the home. 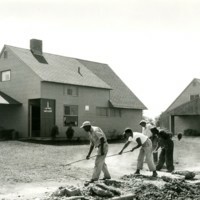 Work crews working on the lawns outside of completed Levittown homes. 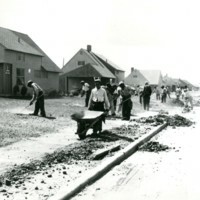 One worker pushing a wheelbarrow is in the foreground. 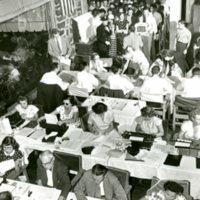 A photograph of people signing rental and homeowner contracts for homes in Levittown, NY on August 18, 1949. 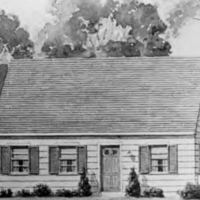 Artist's conception illustration of ranch-style model home for Levitt development. 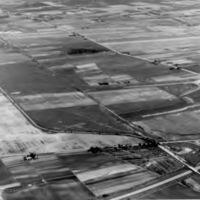 Aerial photograph of Island Trees area prior to the construction of the Levitt & Sons development. 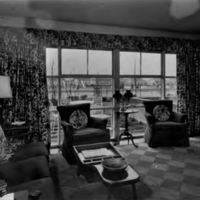 Photograph of the decorated and furnished interior of a model house in the Levitt development.